If you eat meat, biltong is probably up there as a favourite snack. If you don’t eat meat, it’s probably one of the proteins you miss the most. It’s a staple of the South African diet, and we do it better than any other country in the world – which is why biltong could be taking over the jerky market in America. It’s also an incredibly healthy snack compared to the chips, dips and other foods that usually make their way to the refreshments table at a braai. Moreover, it’s a part of our heritage and has a really interesting history. While you might be used to seeing a lot of beef biltong out there, that’s actually a recent thing. 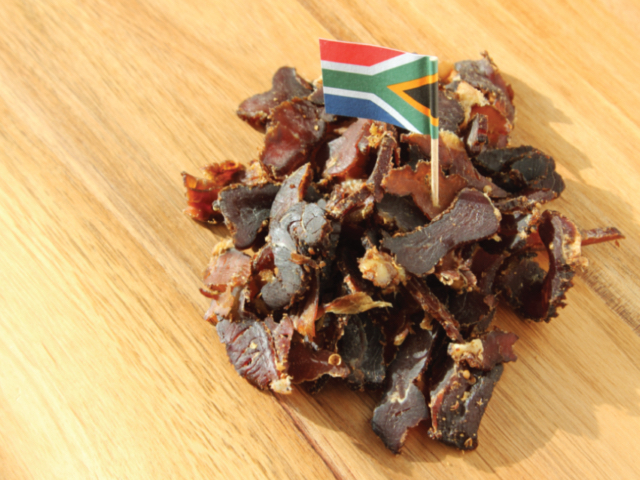 Biltong is made from a variety of meats, ranging from game meat to beef to ostrich. It’s typically made from fillets of raw meat cut into strips following the grain of the muscle, or flat pieces sliced across the grain. Indigenous peoples of Southern Africa, such as the Khoikhoi, preserved meat by slicing it into strips, curing it with salt, and hanging it up to dry. After European settlers (Dutch, German, French) arrived in southern Africa in the early 17th century, they improved the curing process by using vinegar, saltpetre and spices including pepper, coriander and cloves. 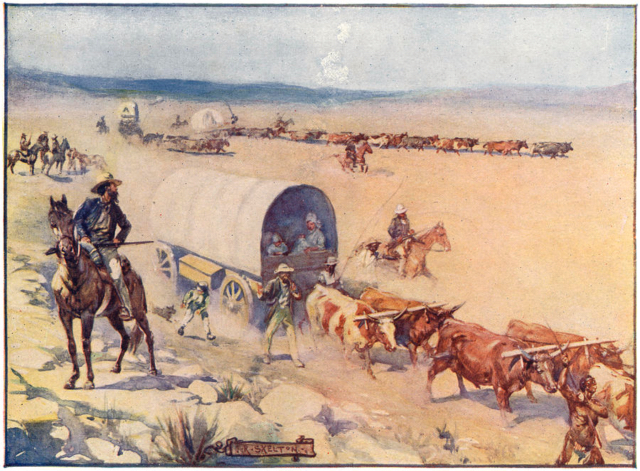 Sidebar – according to South African folklore, migrating travellers, herding their cattle, would place strips of venison under the saddles on their horses. The chaffing would tenderise the meat and the sweat of the horses would spice it. In the colonies, the need to preserve meat was pressing. These were the days before refrigeration, so the meat could go off quickly with nasty results. Building up herds of livestock took a long time but with indigenous game in abundance, traditional methods were available to preserve large masses of meat such as found in the eland in a hot climate. Biltong as it is today evolved from the dried meat carried by the wagon-travelling Voortrekkers, who needed stocks of durable food as they migrated from the Cape Colony north and north-eastward (away from British rule) into the interior of Southern Africa during the Great Trek. It would take two weeks to dry the meat before it was ready for packing. We’ve come a long way since then, and you no longer have to wait two weeks for your biltong. In fact, getting your fix is now as simple as visiting the Shirwood Biltong site, placing an order, and having it delivered to your door. 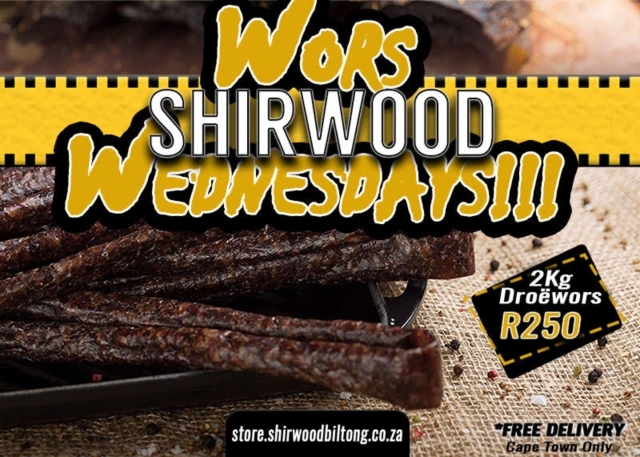 Added bonus – every week they run a Wors Wednesday special, where you can buy two kilograms of droewors for just R250. Their products are made to the highest specifications, using only the finest ingredients at their F.S.A audited facility in Cape Town. Their range, which is tasty and Halaal friendly, is also made using solar energy. They also only use topside cuts, which ensures texture and brittleness in the bite. That’s high quality, perfectly spiced biltong delivered straight to your door, with the added bonus of doing your bit for the environment. Gone are the days when getting your biltong was a trek.